No, no Chuck around here! Are you disappointed? You were waiting for some roundhouse kicks in some badass faces? Some powerful headbutts and throws? I understand your deception. 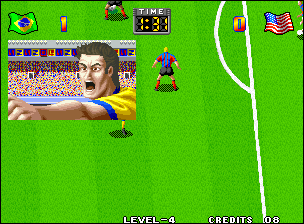 Here, we're just dealing with a good old arcade football game from the ninetie's, so there's nothing to see with the world's strongest man. Are you interested anyway? Okay, so you can keep on reading this review. 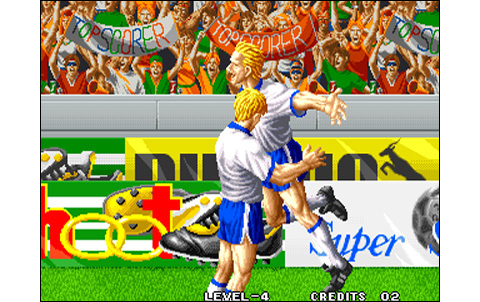 First SNK's soccer game for the Neo Geo, Super Sidekicks was a resounding success in arcades all around the world, but also when it was released on the home system. 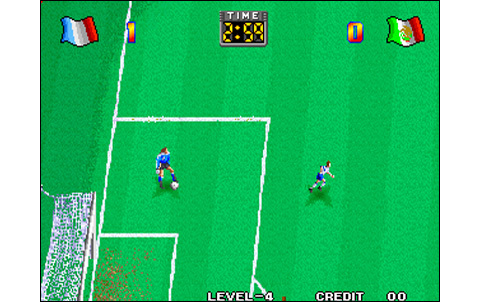 Indeed, in those ancient times, no FIFA or PES games were proposing intense realism as nowaday's games... no ... Back then, it was all about straightforward! those were the times. 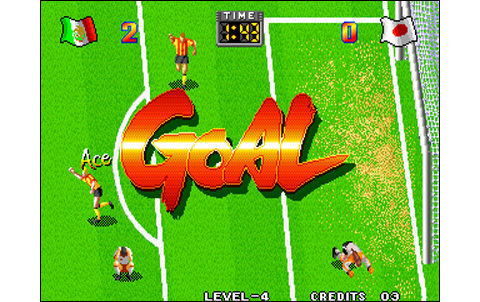 Good soccer games with simple commands, without employing complex strategies, here we only come for the pleasure of punching faces, tackle from behind and score goals, many many goals. 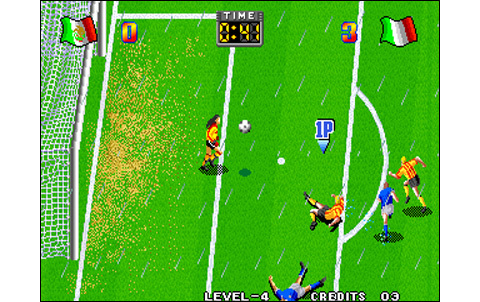 Super Sidekicks is typically the perfect game for parties with friends in the middle of a good fighting games selection. The confrontation often turns to a good laugh, and it connects revenge and revenges again! 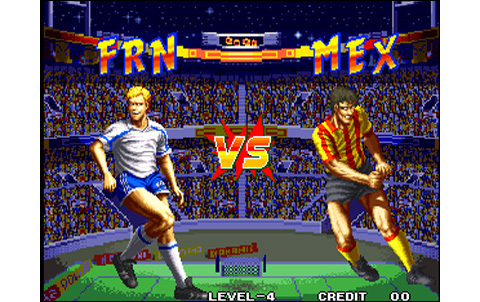 The game offers a pretty decent variety , with no less than twelve teams proposed and three game modes: the SNK Cup is a sort of one-player mode, through which we must progress to the final; the Versus is ideal for playing with friends and the Exhibition match is like a training mode. 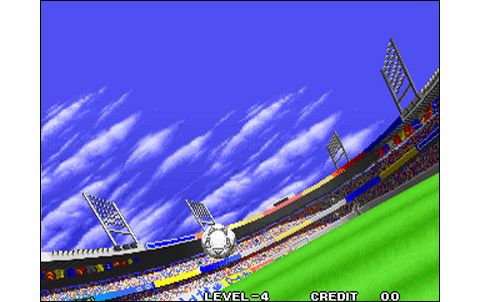 As for the stadiums, they are a few different ones, since at first glance we were able to count about four arenas: a classic day field, the same but by night, another rainy one and also one with a different color grass. 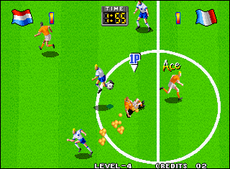 Each team features a captain able to perform more technical moves or more powerful shots than the other players. 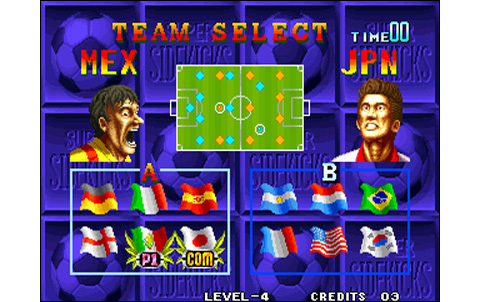 The teams also have their strengths and weaknesses, making the game quite interesting. 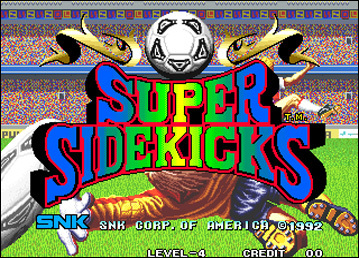 Super Sidekicks plays with only two buttons. There's one to shoot and one for the passes, used for tackle and hit when in defence. Power passing and shooting are based on the pressure maintained on those buttons, but it's up to you to discover those subtleties. Hold a button can either perform a simple or more complex dribble, or even make a longer pass. 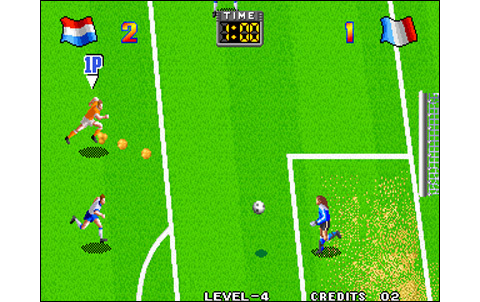 But you can also juggle the ball, make 'bicycles' moves or plunging head... Similarly, the stick handling techniques allow some other dribbles. Let's be clear, all this stuff is still simple and limited, but this is interesting anyway, and we feel that it is what makes the strength of the game: effective gameplay, but instinctive and easy to handle. 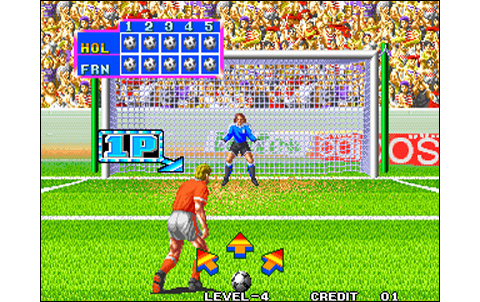 The soft also offers some zooms during stoppages during play and the goalkeeper kicks. Graphically, the style is simple but successful. The colors are beautiful, players simply made but detailed and well drawn. The ball is also impeccably animated, as for the players and the scrollings. Speaking about soundtrack, the rock'n'roll melodies are nice but a little repetitive. A few more themes would have been welcomed. About the various sound effects, we can say the hits, slides and vocals are overall good quality. Only the public cheers sound like a toilet flush that never stops flowing ... and this is not really a good feat! 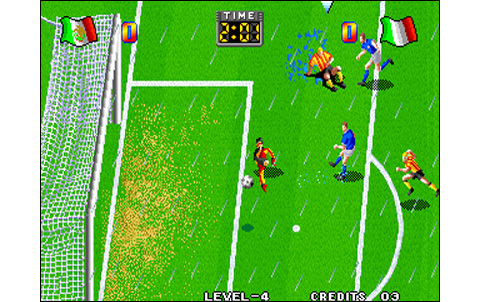 Except for those little shithouse considerations, the game looks and sounds pretty good, as saying that in 1992 it was a reference in the world of football games. 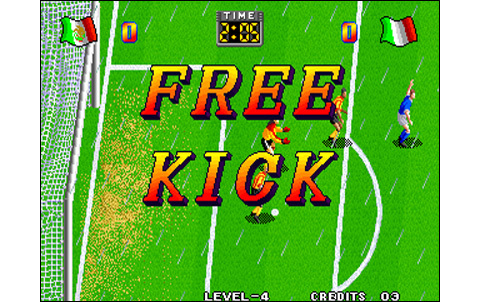 In other words, Super Sidekicks is a great entertainment, whether alone or for two players. But especially for two! Alone, it is not a big deal to clear the SNK Cup, despite the difficulty is sometimes too high and might discourage many players. 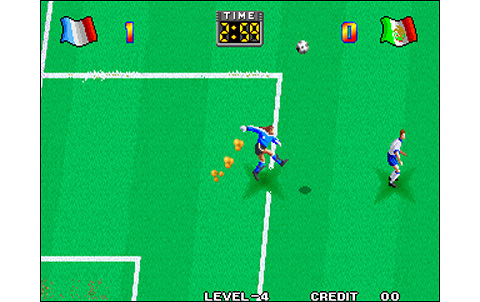 Strategies to reach the goal are various, like the game of dribbles, while arbitration - sometimes rough - exists anyway. 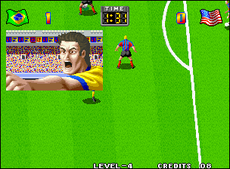 And whether the strategies are monotone and predictable when facing CPU, the game takes its full extent when two human opponents are facing each other. 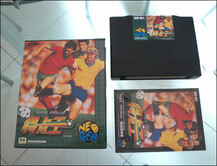 A great football game for the Neo Geo, which i highly recommend for lively videogame nights! 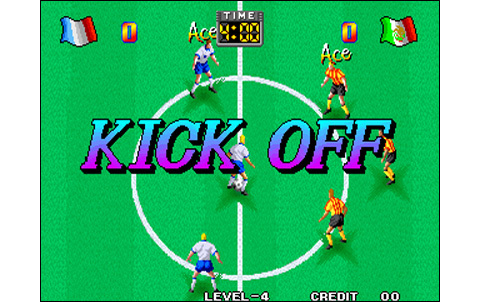 The game is colorful, with various stadiums, zooms, well drawn players and nice intermediate screens! 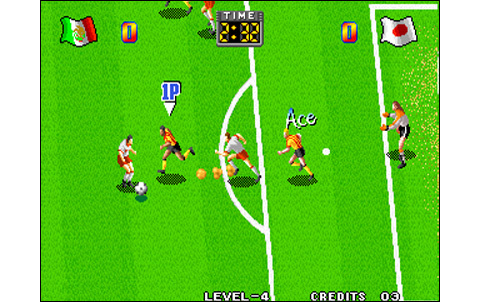 Moves of the players are fluid and it's a good work, effects on the ball and shoots are pretty cool. The game is quite fast, it's all ok. Except for a repetitive music and annoying crowd noise.... it makes Par, good vibes and excellent vocals. 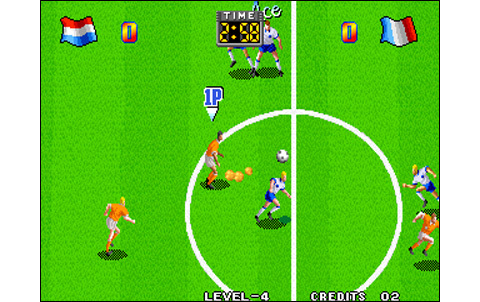 Only one tournament in one player mode, twelve teams... but above all endless games for two players! Not very elaborated, but some good ideas, dribbles and several ways to goal. Simple gameplay, but it works perfectly. The first game from a great franchise, but probably the most "old shcool" one of the genre on the Neo, with a lot of fun for two players! 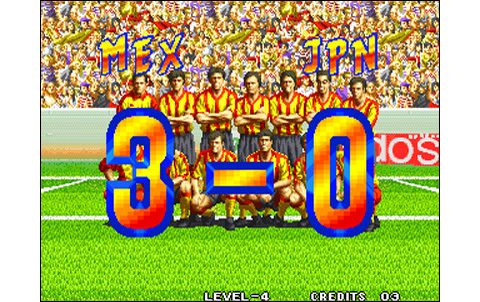 For me, if I were to have only one football game on Neo Geo, this would be it. 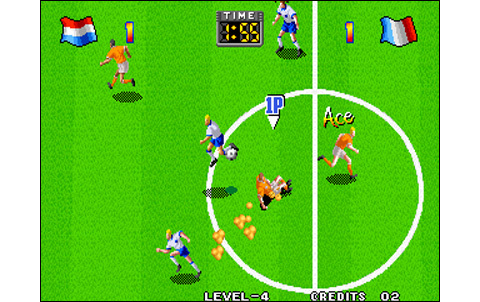 Ultimate Eleven is better but more expensive, Super Sidekicks 2 or 3 are not the same thing... here for forty bucks, you can have some nice competitions with friends!